November 18, 2017 By This post may contain affiliate links. 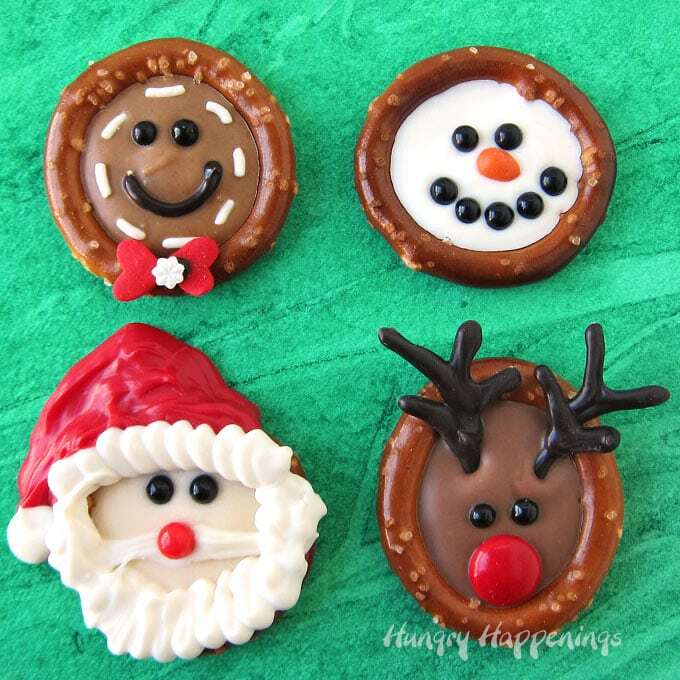 Chocolate Christmas Pretzels never looked so cute. 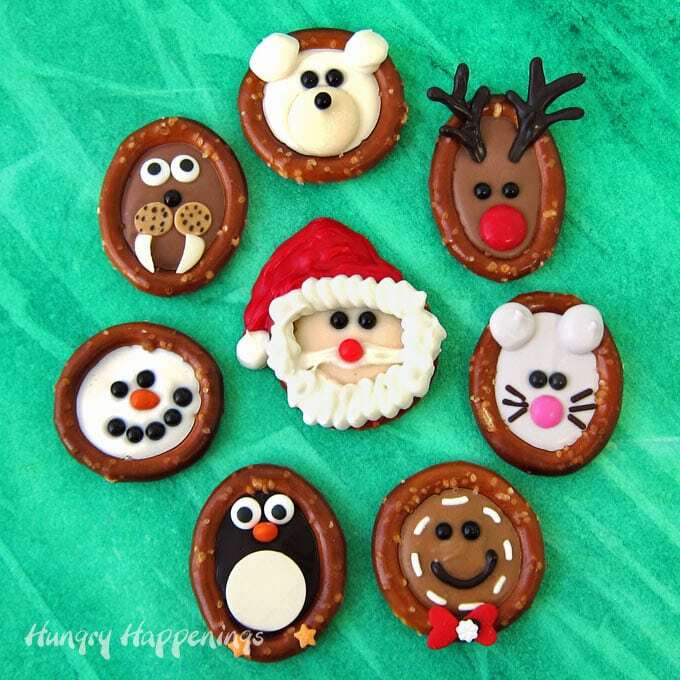 Make one or all of these adorable designs including Snowmen, Santa, Rudolph, Gingerbread Men, Polar Bears, Penguins, Walrus, and a Christmas Mouse. 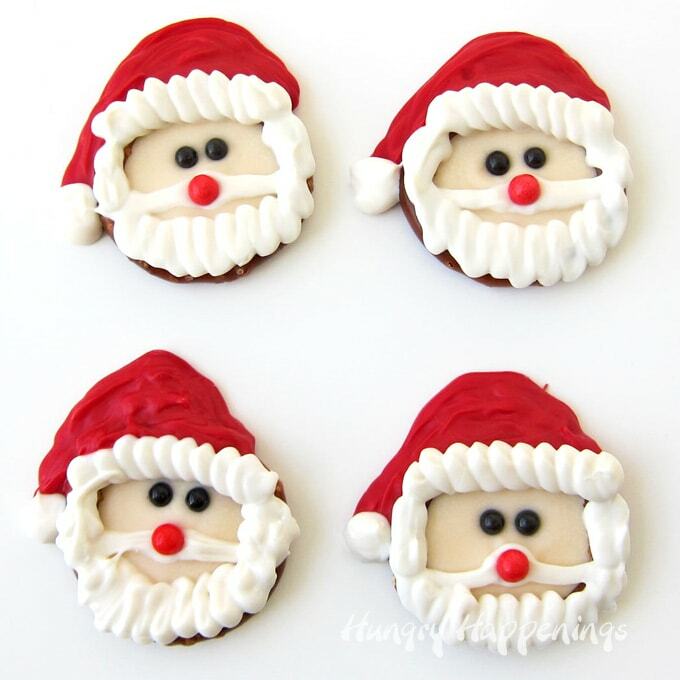 Christmas is such a magical time of year and I am so blessed to spend my days during the holidays in the kitchen creating sweet treats to share with you. 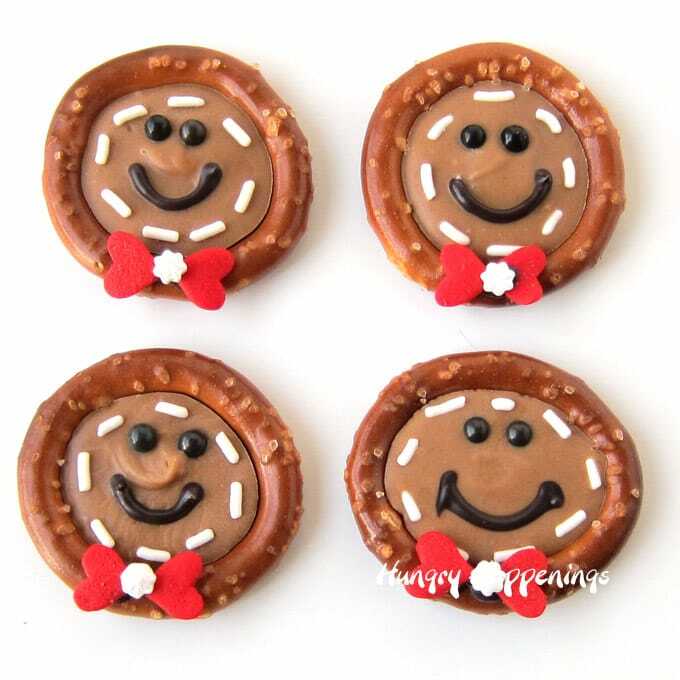 I had so much fun making these Christmas Pretzels that I couldn’t stop. I started out making the snowmen, Rudolph and Penguin, but then I couldn’t resist adding Santa, and a Polar Bear. As I was creating my video tutorial a few more design ideas popped into my head and I just had to add a Christmas Mouse and a Walrus. These pretzels are so simple to make that in no time I had an entire tray of adorable Christmas treats. It has been so incredibly gloomy around here the last few weeks that seeing all of these cute pretzels really made me smile. I hope they have the same effect on you! What do you think? Which Christmas Pretzel is your favorite? I can’t decide between Rudolph and the Polar Bear. But I love the walrus and gingerbread man too. 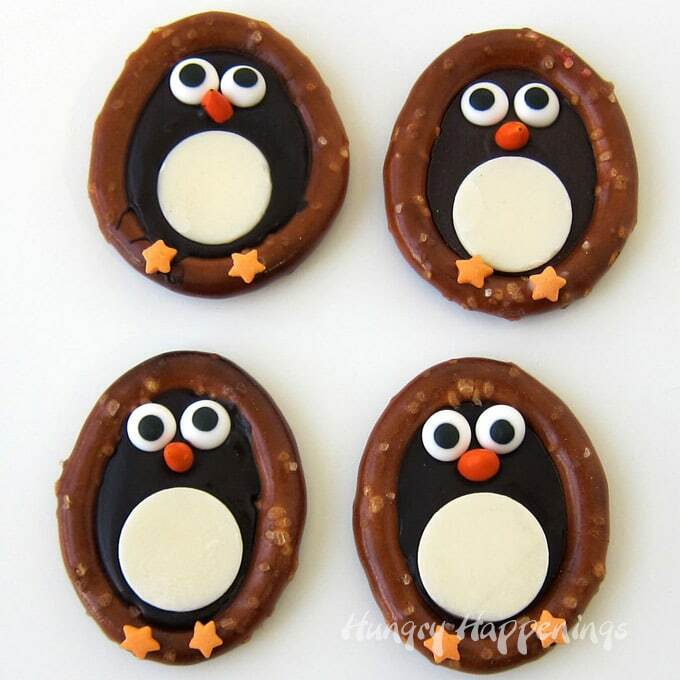 To make each of these sweet designs, you will need pretzel rings. I used Snyder’s of Hanover Pretzel Rings. I found them at the grocery store and I loved their larger size. Each ring is about 2 1/2 inches in diameter. 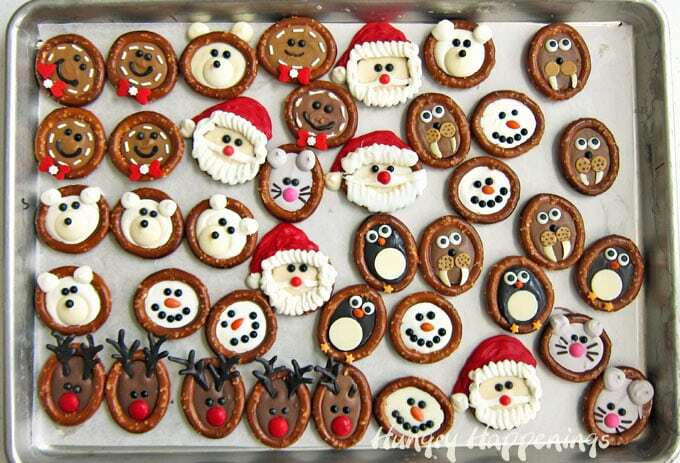 Some are nice and round while others are oval shaped which worked perfectly for these Christmas Pretzel designs. 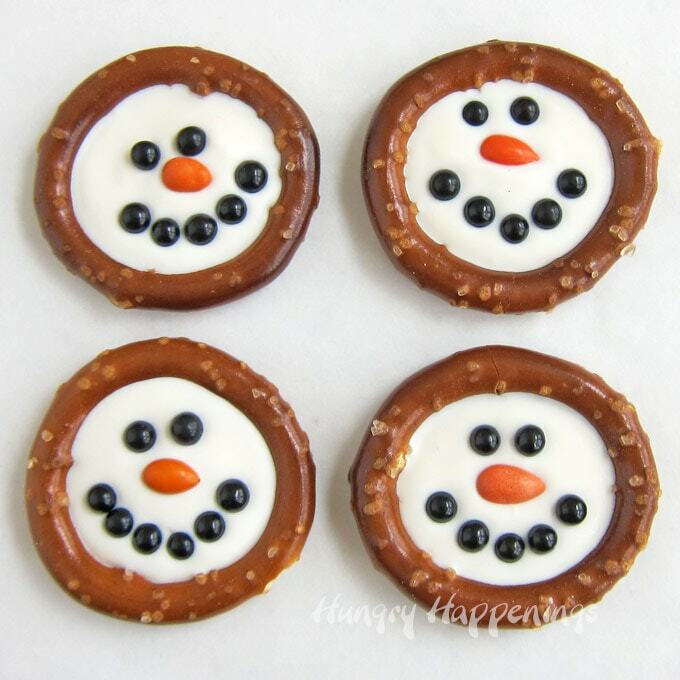 You can use pure milk, white, and dark chocolate (which needs to be melted and tempered) or you can use confectionery coating (Candy Melts) to create all of these pretzels. I used a bit of both depending on the design. Be sure to read my Chocolate Making Tips page for detailed information regarding chocolate and confectionery coating if you are unfamiliar with how to work with each. Watch the video to see how each of the Christmas Pretzels is made then below you’ll find the supply list for each of the designs. Do not allow the chocolate pretzels to chill for too long or they might crack. If using sugar pearls, be sure to let people who are eating them know that they are hard. As an alternative you can use mini chocolate chips. Amazon affiliate links below (commission earned for affiliate sales). Fill center of pretzel ring with white chocolate. Add two black sugar pearl eyes, 1 sunflower seed nose, and five black sugar pearls for the smile. Chill in the refrigerator if using pure chocolate and in the freezer if using Candy Melts until hardened, 4-8 minutes. Fill center of pretzel ring with peanut butter candy melts. Add two black sugar pearl eyes and eight white jimmies around the perimeter. Pipe on a dark chocolate smile and use the chocolate to attach two hearts and a snowflake sprinkle to create a bow. Chill in the freezer until hardened, 4-5 minutes. Pipe dark chocolate antlers onto a parchment paper lined baking sheet. Chill in the refrigerator if using pure chocolate and in the freezer if using Candy Melts until hardened, 2-4 minutes. Fill center of pretzel ring with milk chocolate. 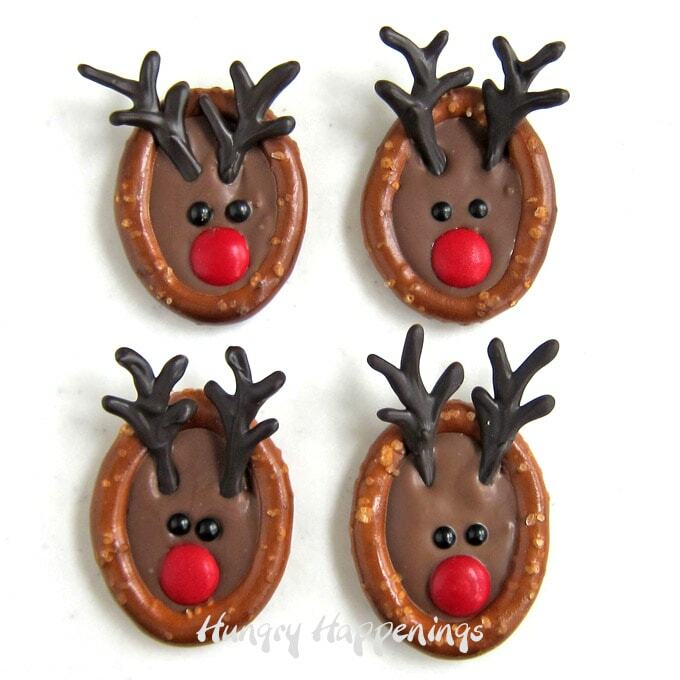 Add two black sugar pearl eyes, 1 red candy coated chocolate nose, and two chocolate antlers. *To get peach colored candy melts, color white Candy Melts using a tiny drop of orange candy coloring or add 1 or 2 orange candy melts to white candy melts. Fill center of pretzel ring with peach colored candy melts. Add two black sugar pearl eyes. Pipe on a red Santa hat. Pipe a white ball and fur onto the hat. Pipe on a white mustache, beard, and hair. Add 1 red sugar pearl nose. Chill in the freezer until hardened, no more than 5 minutes. **I used Peter’s Ice caps (a white confectionery coating) which are 7/8 inch in diameter. Wilton Candy Melts are too large, but they can be cut using a 7/8 inch round cookie cutter. Otherwise you could pipe on the white bellies using white chocolate. 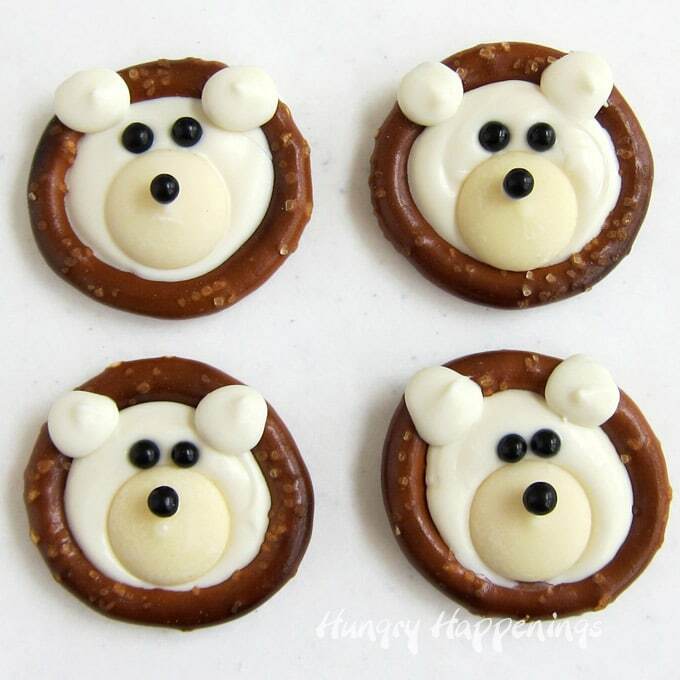 Fill center of pretzel ring with dark chocolate. Add one white chocolate wafer belly, 2 candy eyes, and 1 sunflower seed beak. Attach two orange star sprinkle feet using the melted chocolate. Add two black sugar pearl eyes, 1 white chocolate wafer snout, and one black sugar pearl nose. 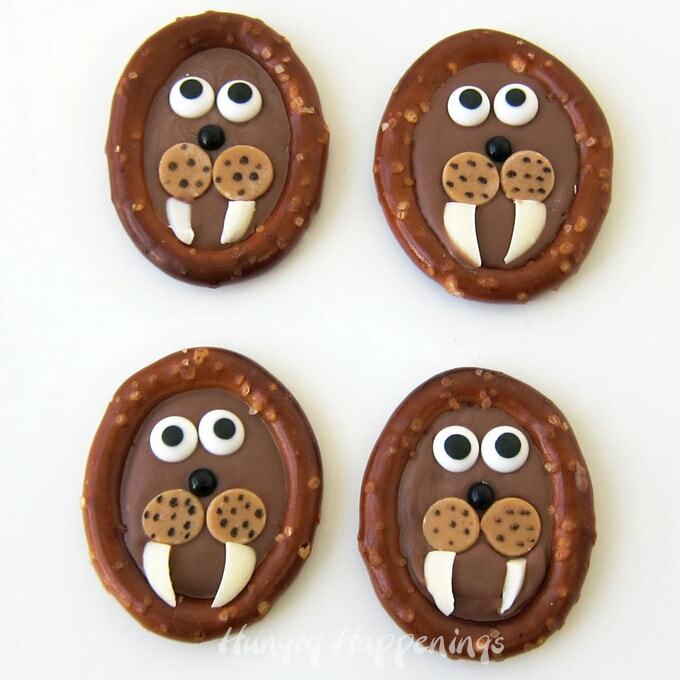 Cut two tusks out of a white chocolate wafer using a knife or a 1 inch round cookie cutter. Add two candy eyes, 1 black sugar pearl nose. Attach two peanut butter chips next to the nose and the two white tusks below the chips. Use a black food coloring marker to draw dots on the peanut butter chips. ***To get gray colored candy melts add a small drop of black or 1 black candy melt to some bright white candy melts. 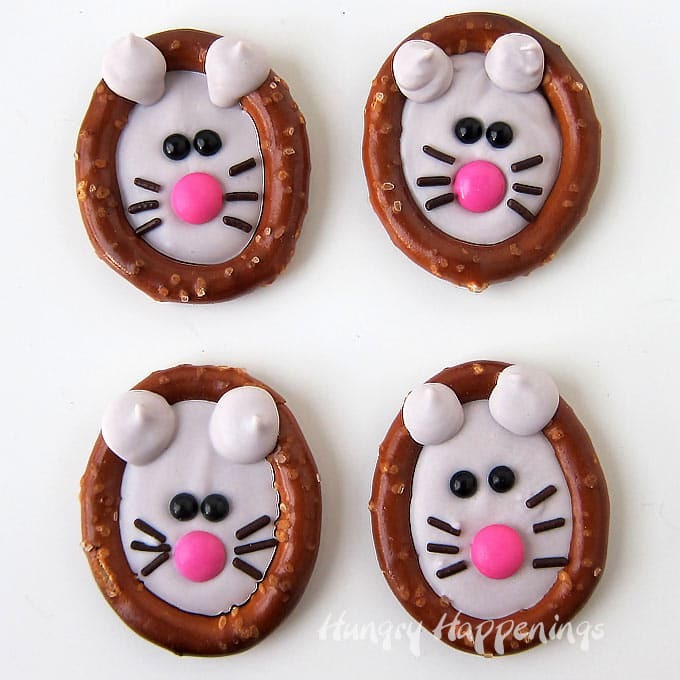 Fill center of pretzel ring with gray candy melts. Add two black sugar pearl eyes, one pink candy nose, and six chocolate jimmies for the whiskers. Pipe on two big gray candy ears. 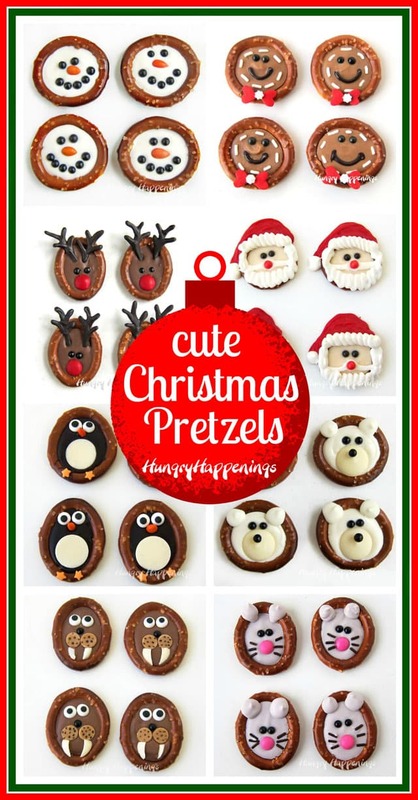 Enjoy making all these adorable Christmas Pretzels. If you make them and share them online be sure to mention Hungry Happenings and link back to this blog post. Use the hashtag #hungryhappenings. You are so sweet Karen! I’m glad you are enjoying my new ideas. Too cute, I think the penguin is my favorite of all the gang! I like the penguin too! Thanks. You’re up north – but here in sunny south Fla. you made me smile also! They’re all adorable, but IF I HAD to pick – I’d say the reindeer and my all time favorite – the polar bear. Such cute ideas for all of them and on a platter it would be hard to decide. Thanks for your never ending ideas! These are so cute! Our Publix finally got some round pretzel rings so I am going to try the snowman. How long will these keep? Thanks Sharon! 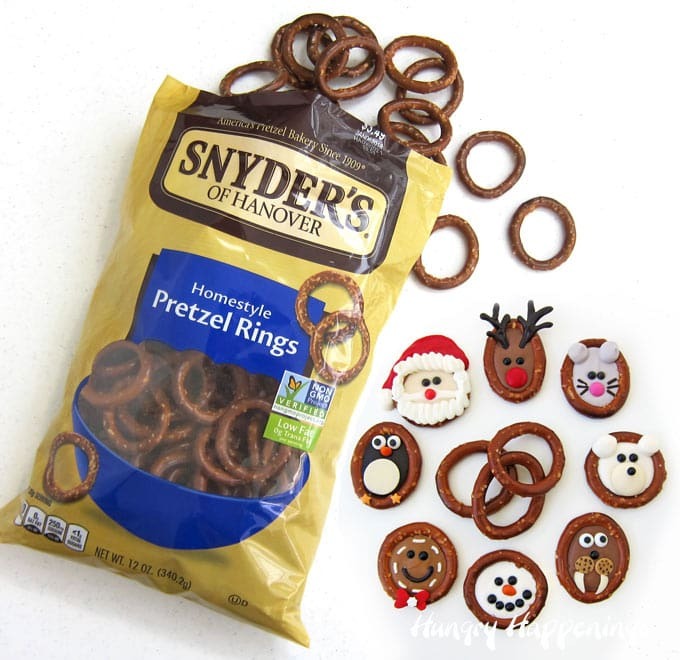 I’m so happy to hear you were able to find the round pretzel rings and I hope you have fun making these fun Christmas treats. They will keep for up to a month depending on the freshness of the pretzels. I hope all goes well with the snowflake filled snowmen cookies and that your grandkids think you are a superstar for making the cookies to share with them.